I created a document on teacherspayteachers.com for whole class journals. I have used these in the past and noticed that it truly motivates the students to write. They enjoy writing about topics that interest them and reading each other's work. The file includes the cover for each binder or notebook and a sample for each piece so that students will know what is expected of them. The only issue that I ran into while doing this in the past is that some of my students thought that they could get away with writing some not so school appropriate things. In order to try to remedy this I created a rule list that can be displayed with the journals. It is also great to review the expectations as a class before setting them out. All of the journals do not need to be set out at the same time so it can really excite the students to see new ones occasionally. 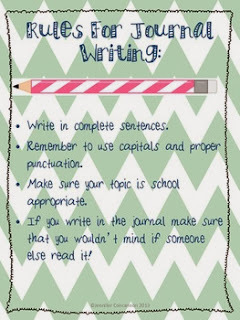 How do you use journals in your classroom?